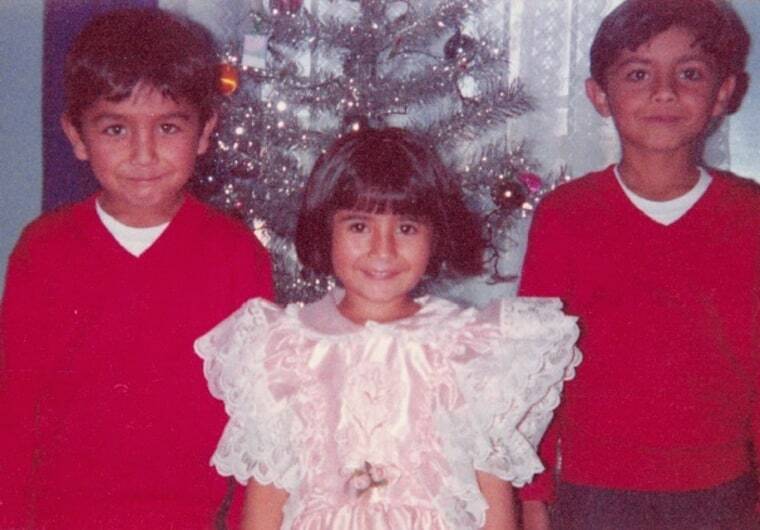 MESA, AZ -- Growing up in a Mexican Catholic household, I always looked forward to the traditions my family and I shared during the Christmas season. For us, Christmas was—and still is—all about coming together to celebrate the birth of Jesus, or as we call him, El Niño Dios. I remember we’d start off the celebration with nine days of posadas, a procession that recreates Mary and Joseph’s difficult journey from Nazareth to Bethlehem in search of a place to rest and give birth to Jesus. The first posada is held on December 16. We’d start each one with a rosary often led by my grandmother, Mamá Nicolasa, and end with a feast. Griselda Nevarez's grandmother, Mamá Nicolasa, leads a night of "posadas" in Arizona. But no feast was ever bigger than the one we had on Christmas Eve to celebrate the last of the nine posadas and to welcome the birth of Jesus. Family members from Mexico and California would travel to Arizona and we’d all get together that night for a special Christmas dinner. There would always be plenty of food, including traditional Mexican dishes like tamales, pozole, menudo and buñuelos. To keep us warm, we’d drink champurrado, which is the Mexican version of hot chocolate, or ponche, which is a fruit punch that’s packed with oranges, apples, pears, pineapples, guavas and sugar cane. Griselda Nevarez (center) is surrounded by her cousins as they light up sparklers for Christmas. After dinner, we’d light up sparklers and wait until midnight to open presents. For me, one of the most exciting parts of the night as a child was gathering to break the piñata filled with candy that my tías brought over from Mexico. Afterwards, everyone was given a goodie bag full of oranges, peanuts and more candy. Today, my family and I still celebrate many of the same Christmas traditions I enjoyed growing up, from participating in the posadas and breaking the piñata to gathering with family on Christmas Eve and celebrating the birth of Jesus. But the Christmas that stands out for me the most happened many years ago. What made it so special was that my brothers, cousins and I to performed a pastorela with the guidance of my tía Gaby, who is a Catholic nun. A pastorela is a play about a group of shepherds who, after being visited by an angel, travel to Bethlehem to witness the birth of Jesus. Along the way, the devil tries to do everything possible to deter them. But an angel intervenes and helps the shepherds reach the stable where they find Mary and Joseph with their newborn, Jesus, lying in a manger. My brothers, cousins and I practiced and practiced for hours until we finally memorized the lines. We wore costumes that our moms made for us and created props from everyday household items. I have participated in other pastorelas in recent years, but nothing beats the memory of my childhood one, under the direction of my tía Gaby. Getting to play the role of Mary was such a beautiful experience for me. It taught me at a young age that the true meaning of Christmas wasn't about presents or Santa. It was about gathering with loved ones to celebrate what we believed - that it's about the joyous day when Jesus was born. For me, that continues to be the true meaning of my Mexican-American Christmas.